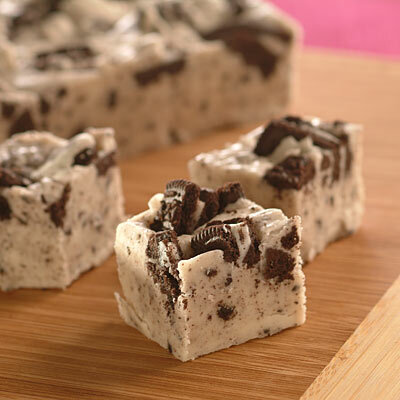 If you like cookies and cream, you’ll have to try this rich, decadent fudge made with cream-filled chocolate sandwich cookies, NESTLÉ® TOLL HOUSE® Premier White Morsels, marshmallow crème and CARNATION® Evaporated Milk. Vicki Fretwell and son Jacob created this 1st Prize winning recipe in their kitchen in Naples, TX. STIR in morsels, marshmallow crème, finely crushed cookies and vanilla extract. Pour into prepared pan. Sprinkle crumbled cookies on top. Gently swirl cookies into fudge using a knife without touching bottom of pan. Refrigerate for 1 hour or until firm. Lift from pan; remove foil. Cut into 36 pieces. Store in airtight container in refrigerator.